Continuing with the theme of sharing some of the photos I've taken over the years relating to all things ice cream, this post is takes 'rhubarb and custard' as its theme. This picture was taken literally seconds after it came out of the oven. It was still bubbling around the edges. 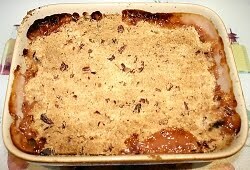 So what do you serve with rhubarb crumble? Custard perhaps or cream .... maybe .... but what about vanilla ice cream? 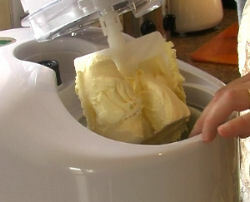 Here is a batch of homemade vanilla ice cream that I made with my favorite ice cream maker at home - photographed just as it came out of the machine. Imagine a scoop of it on top of freshly made, hot, homemade rhubarb crumble. Now that's what I call a (n)ice dessert! Read about rhubarb on BBC Good Food. Cesar Millan & Ice Cream - Again!